Do you avoid feeding nuts to your birds because they are nothing more than fat-laden treats? If so, it is time to rethink this popular myth. Because of the recent trend toward fat-free diets, nuts have gotten a bad reputation which is both undeserved and inaccurate. Recently, two major scientific conferences have extolled the virtue of nuts because several large-scale studies found that nuts contribute significantly to human health. In fact, the latest evidence suggests that nuts may play a role in reducing the incidence of coronary heart disease and certain kinds of cancer. I purchase dry roasted, unsalted, shelled nuts for my birds. Always check them for freshness. Do not ever give your birds stale nuts. Many speak of fruits and veggies as needed with a pelleted diet. There are very few whom speak of nuts. Infact, as a new parrot owner I have been told over and over again not to feed nuts at all. I offer fruits, nuts, veggies and pellets always to all my flock. I offer nuts daily and so do a lot of parrot caregivers. 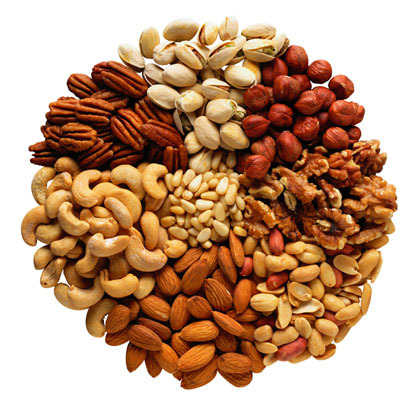 Nuts are an excellent source of protein, fiber and many good things. Nuts actually help to lower the bad fats. All of my birds are at healthy weight and my avian vet approves of their diet. I do include many greens, small amounts of fruit and some cooked items on a daily basis. My birds are all flighted and have an average of 8 hours of out of cage time daily, so they do get a lot of exercise. If you are concerned, speak with your AV. Where do you buy nuts for your fids? My brat love them, but I’m always worried about how they’re processed. Do you have any suggestions or tips on purchasing local, or finding an on line retailer?